Women under estimate the merits of an excellent hairdryer. There are so many around these days that its easier to just shut your eyes, spin around and then point at random to make your selection than it is to stop and examine each individual hairdryer. However, research can pay off as something that simply blew hot air at your barnet to dry it a few years ago has now progressed to a tool which can now curl, de-frizz, straighten, style or do pretty much anything you want it too. We understand that not everyone has the time and energy to sit and research hairdryers for hours so luckily Beauty Resource have done some legwork for you and we found a diamond. Remington’s Shine Therapy Hair Dryer made some wild claims about being able to blow-dry, moisturise and condition your hair all at the same time, killing three annoyingly time consuming birds with one stone. After looking at numerous reviews about this product the response seemed to be mixed with half the users raving about the product and half giving it the proverbial thumbs down. Obviously beauty reviews are great and you would be wise not to spend your money on something that has nine out of ten appalling reviews, however its really important to consider that everyone is different and something that works wonders for you might be absolutely useless for someone else. All things considered we took the plunge and got ourselves the hairdryer. The hairdryer comes with three shine therapy cartridges which are basically little pods of goodness that emit a delicate mist over your hair when you are drying it. This is what makes the hair shiny and gorgeous due to the formula containing goodies such as a light blend of shine-enhancing moisturisers and avocado oil, rich in vitamins A, D, and E.
For us the hairdryer fulfilled all of its promises leaving the hair feeling soft and moisturised and just generally in great condition leaving it frizz free with a healthy shine. The only downside is that one you have used up your three shine cartridges that come with the initial purchase of the dryer you will have to purchase refills at an extra cost. However the pros far out way the cons. Not only does the hair look great, but the time it takes to style the hair is reduced and the cost of buying styling sprays is eradicated meaning you are not really incurring any additional costs. Each cartridge will give you around 40 blow dries and the dryer comes with a 3 year guarantee. 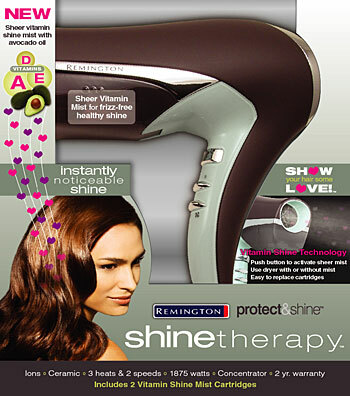 Remington D4444 Shine Therapy Hair Dryer is priced at £48.75 and is available from Boots and other good beauty retailers. The shine therapy refills are priced at £5.89 for two.